As I mentioned in the email last week- the Tech Tuesday blog is having "technical issues". I checked with Weebly support again today- and it has been escalated... but no solutions yet. The post links seem to work, but when I link to just the site- it is missing the archives, and is squished, etc...generally a mess. So- hopefully this page will be the temporary solution while they figure out what broke. Matt Miller wrote an excellent blog post with ideas for how you can use the new changes in classroom. Here's a quick video tutorial from that post. Alice Keeler also has step by step written and screenshot instructions. If you have time, read her take on the use of this for differentiation- interesting. ​ Diigo is an online bookmarking service. This means that you can bookmark on one computer and see all of your bookmarks at home, or on another device. I've used this service since about 2008 and have over 11,000 bookmarks- all tagged and easy to find. The premium version will also allow you to save cached pages- so that when a site disappears, you can still access the cached version. All students in grades 4-6 at HES have Diigo accounts. We have a teacher dashboard and can see all the sites the kids bookmark. This can be really helpful for collaborative projects. Diigo has outliners, annotation and has added a new screenshot annotation tool. "The Evil Spirits of the Modern Day Press". Puck US magazine 1888; Nasty little printer's devils spew forth from the Hoe press in this Puck cartoon of Nov. 21, 1888. The problem with fake news is not anything new. The terminology has changed a bit- from yellow journalism to media literacy to "fake news" and “post-truth” but the message is still the same. Educators and students need to sharpen up our CRAP detectors. You can take Howie Reingolds' mini-course, teach your students a memorable acronym or check out the plethora of lessons on offer from Kathy Schrock. We all live in our own little bubbles and we often create our own echo chambers - listening to, watching the news, videos from - only the folks that we agree with. It may be outside of our comfort zone, but we may well get closer to ferreting out the truth if we look, and train our students to look- outside our bubbles. Check out the graphic below from i.imgur- sorry not sure about the attribution- maybe Vanessa Otero‏@vlotero. See full size. 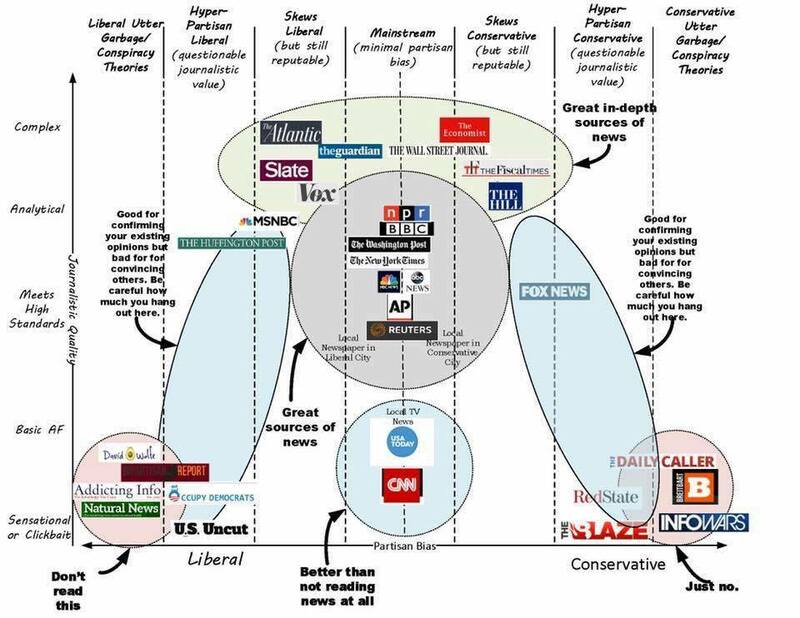 Here's a list of sites with Lesson Plans you can use to learn more about fake news and to help teach your students how to be more critical of information from news sources. One of the new resources this week is the updated Diigo chrome extension. Diigo is used for bookmarking and annotating. The new chrome extension streamlines these features and adds a new screenshot annotation tool. So, why should you care? Diigo can help you categorize bookmarks and share them across all of your devices. It can be used as both a research and a note-taking tool. You can create groups in Diigo and share bookmarks with your peers or create student groups. I've been using Diigo since 2008 and have over 11,000 bookmarks! Now, some of these sites no longer exist- but the premium Diigo version also offers a way to save a page cache- so you never lose the resource. You can sign up as a teacher for a free accounts and get a teacher dashboard to monitor student accounts. Students at HES in grades 4-6 have Diigo accounts. I sent out an email blurb about this last week, but essentially you can now differentiate your assignments in Google Classroom. Matt Miller of Ditch That Textbook has created a brief tutorial. Last, but not least... 3D Toontastic. Google bought out Toontastic a while ago and has just released a new app for digital storytelling- 3D Toontastic. The really cool thing about this- it works on "some" chromebooks. I haven't tried it out on the chromebooks at HES- but my personal chromebook is on the list. It is also an android and iOS app. And- it's free. So- if you have the time- and the right device- check it out! Do your students know how to search effectively? Does this jibe with what you have observed? Search is a gigantic topic. It is also one of the things that I find that many students and sometimes their teachers don’t have much information about. One could easily spend an entire year teaching a course on search… but let’s condense it to a blog post for today. There are some amazing resources online if you want to learn more. Google has a site for educators with lesson plans. There are two online courses to help you learn more about search. This one on power searching is ongoing- starts up every 2 weeks and there is a great course called advanced power search that you can take any time and progress through at your own pace. Alan November has been a strong advocate for information literacy for years. Here are a couple of questions from his site. Can you answer them? *What clues in a Web address might indicate you are on a personal website? HES resources include links for search on Symbaloo. Symbaloo gives you a handy visual way to bookmark helpful links for search for students. Although one can make a custom Google search for student use, my experience has been that after the first link the students tend to wander off to the omnibox. A quick overview of the changes teachers and media specialists see in schools today. Remember- You Can't Just Google It!